After our filling lunch at Gumshara Ramen, we decided to take a walk back to Surry Hills and we felt like having something sweet. What came straight to our minds was Gelato Messina, knowing that it is not too far from our hotel. The moment I stepped into Gelato Messina. It was gelato heaven and there were so many different flavours that I want to try them all. 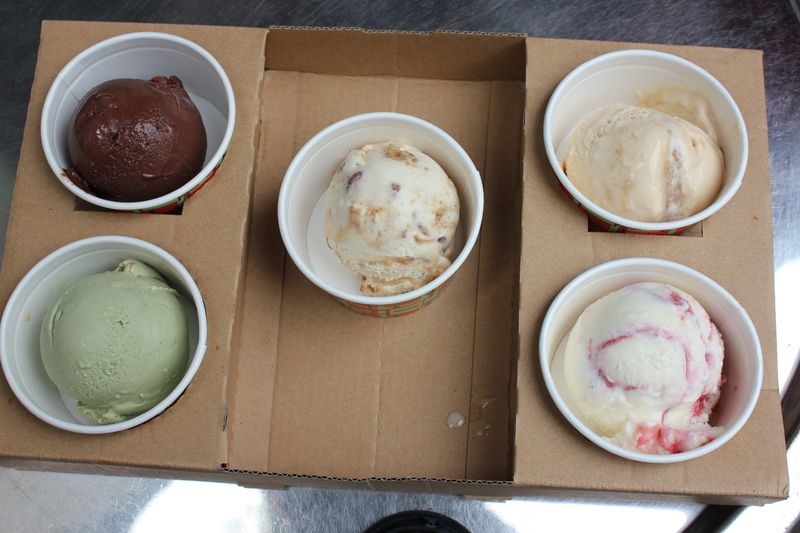 My two friends left me to make the decision to choose five flavours for the gelato tasting plate ($12). I was spoilt for a choice but luckily I was able to take some testers before making up my mind. In the end, we went for the Chocolate, Messinaitis, Monoffee Pie, Pear and Rhubarb and Pistachio. The Messinaitis consists of malt peanut gelato smashed with caramel coffee, doughnuts and candied pecans. The Monoffee Pie is a mix of caramel gelato with banana jam, whipped cream and pie crust. How delicious does that sound! My favourite had to be the Chocolate but that’s because chocolate is one of my favourite ice cream flavours. It was dark, rich and very chocolate-y. Mmmmm. The Monoffee Pie and Messinaitis was another smash hit too – it was bursting with flavours. Superb. Yes, I was definitely taken to gelato heaven and I can’t wait to be back to Gelato Messina to try other flavours.